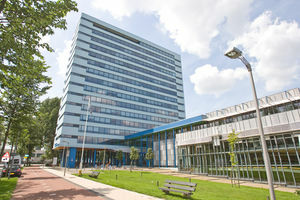 The research within ATO originates from two Chairs: the KLM-sponsored Air Transport Operations Chair of Professor Curran and the NLR ATM Safety Chair of Professor Henk Blom. The KLM Air Transport Operations chair focuses on the advanced multidisciplinary modelling and optimization of key air transport performance criteria such as operational efficiency, capacity, cost, and green operations; strategically coupled to EU SESAR and US NextGen goals. Safety is addressed through the ATM Safety chair. The courses offered are specifically designed and arranged to build towards high-quality thesis work that is internationally ground-breaking in three specific themes within in the ATO MSc profile core and associated electives. 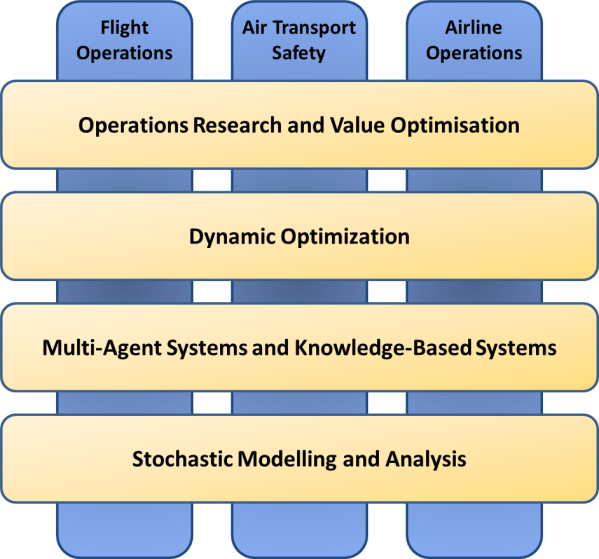 Aircraft performance optimisation and airline performance optimisation are the two ATO themes. The NLR ATM Safety chair focuses on the socio-technical and safety-critical aspects of air transportation. Although the potential number of fatalities in air traffic is lower than in nuclear or chemical industries, the more demanding aspect of air traffic is the highly distributed nature of its agents. Each aircraft has its own crew which interacts with air traffic controllers on the ground. This implies a highly distributed network of interactions between many human and technical systems. These highly distributed interactions pose complementary challenges to safety risk analysis of air transportation. The basic approaches used are agent based modelling and analysis of socio-technical systems. Theme 1: Flight Operations – this is focused on developing our expertise in trajectory optimization, flight planning, green operations and efficiency and sustainability of airport operations. Theme 2: Air Transport Safety – this includes safety/capacity analysis of advanced ATM concept of operations; Improving resilience of commercial aviation to disturbances; and agent based modelling of the impact of human coordination on air transport system performance. Theme 3: Airline Operations - this includes both operational and maintenance expertise. Operations includes network, fleet configuration, fuel economy and sustainability, and scheduling optimisation. Maintenance includes reliability, efficient and green maintenance process and logistics optimisation. Competency 1: Operations Research and Value Optimisation – this is focused on developing expertise in the modelling of established KPI (such as efficiency, cost, environment and safety) so that novel and challenging multi-objective optimisation solutions can be developed and validated. Competency 2: Dynamic Optimization – this includes the development of efficient optimisation techniques that can solve real-time optimisation problems with changing input data or moving constraints. Such efficient techniques can allow more information or variables to be process (in more elaborate objective functions) but the main goal for ATO is developing real-time solver methods. Competency 3: Multi-Agent Systems and Knowledge-Based Systems - this competency is defined by the exploitation and development of AI techniques in general that enable novel operational research solutions. Multi-Agent systems provide the inclusion of socio-technical modelling and the opportunity to simulate emergent behaviour, while Knowledge-Based systems improve the formulation of operational processes and organisational architectures. Competency 4: Stochastic Modelling and Analysis - this includes addressing deep operational uncertainties and investigating the ability for stochastic approaches to deal with this. This ranges from uncertainty in modelling reality itself, as characterised by a Monty Carlo approach, to also dealing with uncertainty of the actual models and their limitations. There is also a growing PhD research group in ATO. PhD's tend to be externally funded either on national/international programs or through private funding. If you have graduated from a top University and would like to consider doing a PhD with us then please feel free to send your expression of interest to secr-ato-lr@tudelft.nl. Here you can find interesting links to website's that relate to ATO, the students, ALUMNI or research subjects. Please keep us informed of any interesting website's on these matters!